One index pointer, two shift buttons, one space key and a type wheel were all that German designer Paul Muchajer needed to produce his small index machine. The machine appeared in 1924 and was a considerable success. According to one source, more than 80,000 of these machines were built. The Gundka is a machine with many names, but just one face. 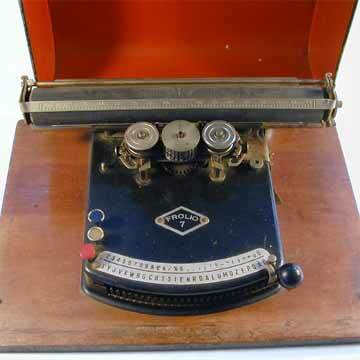 The machine appeared as the G&K, the Frolio, Scripta, Perlita, Write-Easy, M-W and Gefro. There were quite a few different models with minor differences. Depicted on this page are the Frolio 7, the most standard version of the Gundka, and the more rare Kleine Gundka, a smaller version.